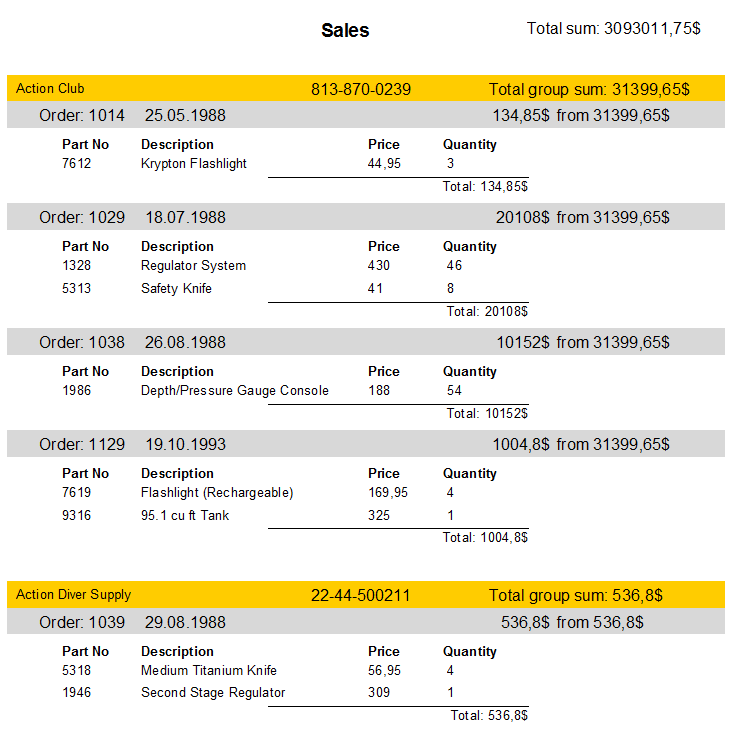 How to display totals in a group header in FastReport VCL 6 - Fast Reports Inc.
One of the new features appeared in FastReport VCL 6 is the ability to display the grouping results in the header bands. Previously, you could only display the results after grouping. If the group is large enough, you have to scroll it down to find out the result. It is much more convenient to print the result in the group header. Let's look at the peculiarities of using the totals in the header bands. At the beginning a little theory about how it works. The totals in the headers are implemented using deferred processing. During report output, all objects that have non-standard processing conditions are placed in a special list. Then, upon reaching a certain condition, the processing of the object is triggered. A paired footer band must have a field that calculates the total. The same field will be added to the header band. If you do not need the result in the footer of the group - just make it invisible. Now consider the new property of the "Text" object. 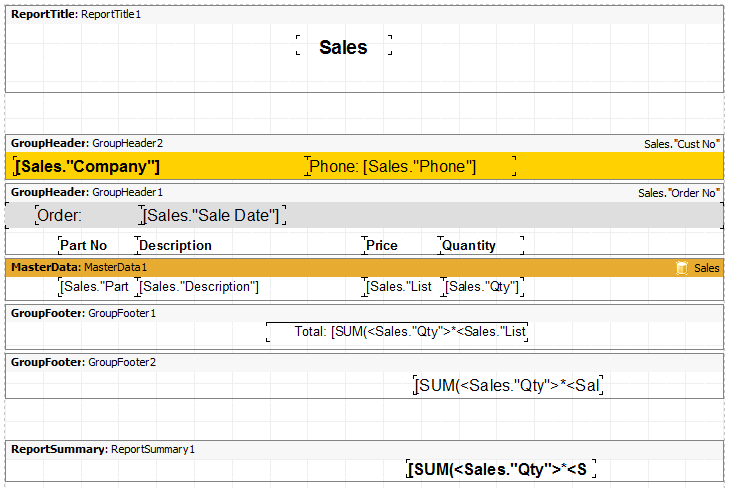 The Processing property allows you to define an event by which a value will be displayed in this object. In fact, Processing includes 2 properties - GroupLevel and ProcessAt. GroupLevel allows you to set the nesting level of the groups. This is done in case you use several nested groupings. 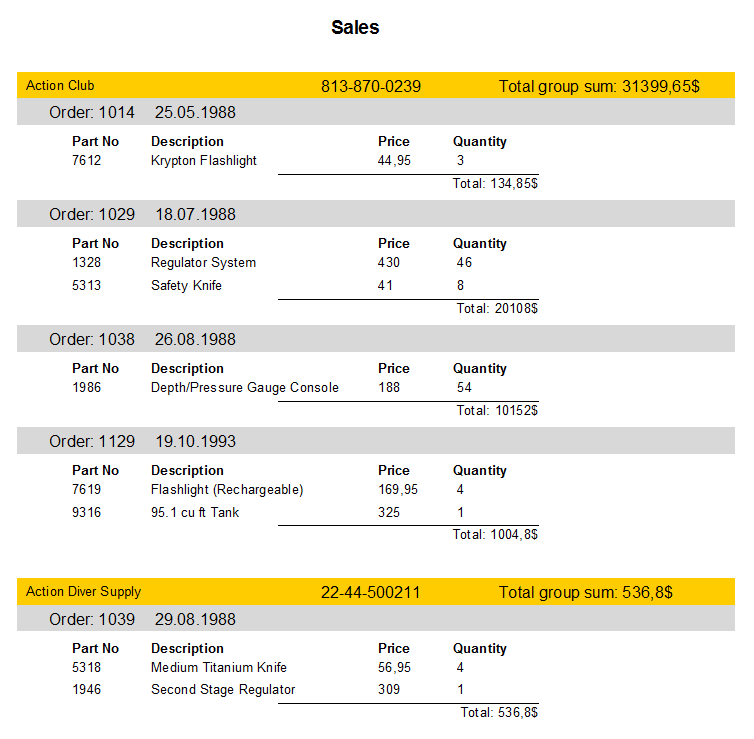 Thus, you can display your totals in each heading in each group. paReportPageFinished - when the report template page is displayed. For example, you have chosen to generate a total when the group ends. To find out that the group has closed, the FR requires a group cellar. If the selected event is paReportFinished, the band page footer is required. Now let’s consider all of the above in practice. We need to create a report with two sessions. One is embedded in another. 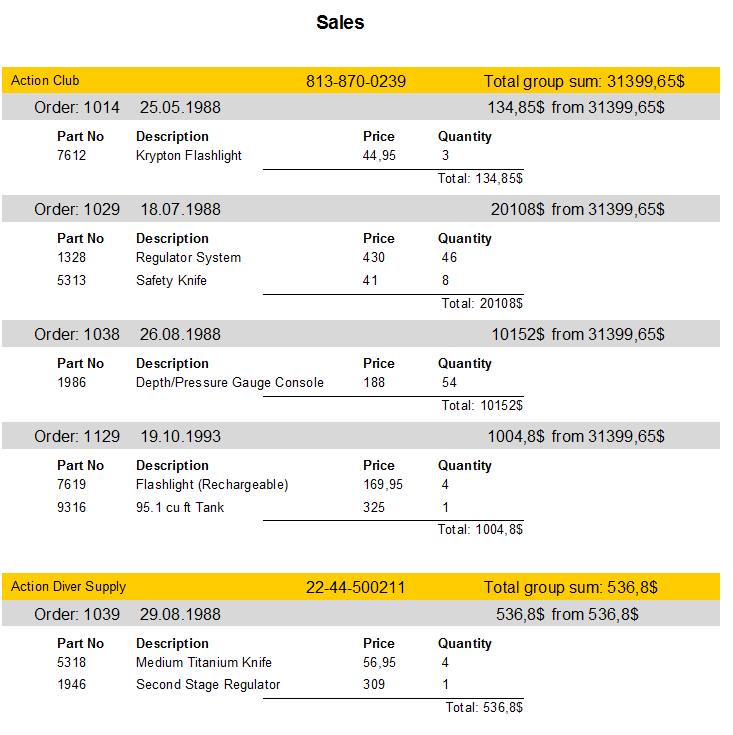 Take the Sales table from the demo database. [SUM (<Sales. "Qty"> * <Sales. "List Price">, MasterData1)]. The summary is displayed in the report summary band. Now let’s add two text fields to the second group. We will place them one after another on the right. For the first group, the value is "[SUM (<Sales." Qty "> * <Sales." List Price ">, MasterData1)] $". For the second one - "from [SUM (<Sales." Qty "> * <Sales." List Price ">, MasterData1)] $". Now for the first group we set the properties: GroupLevel - 0, ProcessAt - paGroupFinished. For the second one we set the same properties: GroupLevel - 1, ProcessAt - paGroupFinished. In each case, we display a field with the same aggregate expression, but we get different values for the groups and the report header. It's all about the time of formation the total. At some time point, the aggregate function has different values. That's why it's important to set the ProcessAt parameter correctly.